Number 5: Why Europe is a Missionary’s Dream! Most Christian churches/missions organizations have followed the church growth axiom of searching for areas of receptivity to which to send and spend their resources. During the last half century, this strategy has led to a lot of people and resources going to places like East Africa (English-speaking and less Muslim) as opposed to North Africa, or places like all the former Soviet countries—at least for about a decade—until post-soviet materialism took root and the eastern peoples became less interested. South America, especially Brazil, was a hotspot for American missions for a couple of decades, but that has settled down now as indigenous leaders emerged and no longer need the baggage that comes with American money and Christianity. Today, China is certainly in the missions’ spotlight, though political restrictions keep people from reporting the statistics that are essential to establishing patterns of receptivity. India continues to remain high on the list of receptive countries. The poverty and class struggle also keep it on the list for young emergent churches as well. One of the most passionate discussions in missions centers on the vast populations of non-Christians in the 10/40 window, that is, the countries lying between 10 and 40 degrees north of the equator, including Saharan and Northern Africa, as well as almost all of Asia (West Asia, Central Asia, South Asia, East Asia and much of Southeast Asia). Roughly two-thirds of the world population lives in the 10/40 Window. Most of the people in these countries claim the Muslim, Hindu, Buddhist, Animist, Jewish, or atheist faith, and few of their governments allow any kind of legal Christian activity on their soil. Christian radio breaks through these barriers, but very few missionaries are called or sent to these sites, and very few churches/missions organizations target them either. And if receptivity is our sole criteria for resource allocation, then why would we? Any work done in the tough areas of the 10/40 window would likely take decades if not lifetimes to show first fruits—and might cost lives. What if I could show you both the potential and the freedom to meet, to befriend, to minister to, and, yes, to share your faith with 5 million Arabs? With over a million Pakistanis, or hundreds of thousands of Iranians? Would you be interested in using missions resources to reach out to Iraqis, Somalis, Algerians—if you could do it where it was not illegal and under favorable conditions for the reception of the Word? Europe, known to missions people as . . . well, really not known to missions people because Europe has had its chance and has never been on anyone’s receptivity list. But I want to say that the new Europe is a place where we MUST be—because that’s where we can speak with much of the world that is otherwise extremely difficult to penetrate. In 1985, the European Union passed the Schengen Agreement, which allowed for free movement across borders for all citizens of member countries. At the time only ten fairly homogeneous countries composed the EU, but now, with the Agreement extended and expanded, 27 countries enjoy relatively unrestricted movement throughout the EU. Nine million Turkish people live outside of Turkey in the EU. Eight hundred thousand Romanians live in Spain. Twelve million immigrants live in France and 40% of those immigrants live in or near Paris. What does this mean? This means we ought to send missionaries to Paris, to Spain, to Germany, to the UK, and to Sweden, a country so friendly to immigrants, by the way, that they do not even count them. Although some immigrants naturally cluster together and are resistant to integration into their new countries, many more long for new relationships, which makes them more open to a Christian’s friendship than they would be in their homelands. European laws do not restrict Christian work. Going to the west, for many immigrants, is the opportunity to explore new ideas. Christianity is seen as a western idea, so it is natural for some to want to learn about it. Restrictive cultural laws and traditions are usually mitigated, if not abandoned, in their new land. For instance, most women from restrictive Muslim countries are allowed much more freedom when living in Europe than they would have at home. While social media and other public media are often highly controlled and restricted in their home countries, these immigrants have access to every media avenue (for better or worse) in Europe—which brings opportunity for all kinds of Christian information into their homes. Americans think of immigrants as being primarily impoverished people, but that is not necessarily true of people movement in Europe. I was just reading about a newly licensed medical doctor in Romania who could get no job there, so she immigrated to Germany, which is in desperate need of her services. These immigrants will undoubtedly meet others of their own nationality/religion who have become Christians. They must deal with this new cloud of witnesses. Just a couple of years ago, an LST team of mature Christians from Texas spent two or three weeks working with a church in Cologne, Germany. One of the members of that team was telling us about a Reader of hers from either Iraq or Iran, who actually belonged to a militant cell, but who would sneak away from his group to come and read the Bible with her 2-3 times each week. He feared for his own safety, but in Cologne, Germany, he had the space to go far beyond what he could have done in his home. I don’t know what has become of this young man, but I know another story that started just as his has. Almost 20 years ago now, an Iranian man also responded to a simple ad for practicing his English and started reading with a Christian. Today, he is one of the elders in his church in Cologne, Germany. Europe is a great mission field! If you don’t think so, you’ve got your old glasses on! That’s where the world is! The whole world!! Great post and you are right, Mark, about Europe being a strategic place. We work in southern Italy and have many non-Italians right here in our tiny village: Moroccans, Romanians, Albanians (an extremely closed nation in the past), etc. We are excited to see more opportunities arrive all the time! I also agree with Tim Rebecca Brinley that people have often given up on missionary work in Europe because it is expensive and it will take long-term work. Encourage people, please, to make that kind of commitment to the forgotten and oft-overlooked mission field of Europe! As far as the expense, perhaps that is why God seems to be awakening many of his people to the necessity of a Simple Life. [http://www.lausanne.org/se/documents/lops/77-lop-20.html] Simple living can help most missionaries stretch their funds so that they can stay on the field! And please encourage those “back home” to see that if they also live more simply they can increase their support to the field. Together we CAN get the job done! So true Mark. Many great opportunities, especially for self supporting missionaries. I think what has held many back from Europe has been the relative expense of living there and the long term commitment perceived necessary to really get the work done. I remember even in 1977 our team in Turkey being invited by the Catholic Archbishop in Vienna to come and work among the Turkish minority of 10,000 in his parish. Tough to do on the 200 dollars a month I was living on at the time, but if I could have found a job there it could have been a good opportunity. Things have certainly accelerated in terms of immigration since then. I liked Bruce’s comment too. In our small town it is very common to meet Iranians and Afghani’s of late, just to start down the list of recent immigrants is amazing. Going back just a few years you can get a statistical printout for your region. Here is a sample for San Diego from the Census bureau. 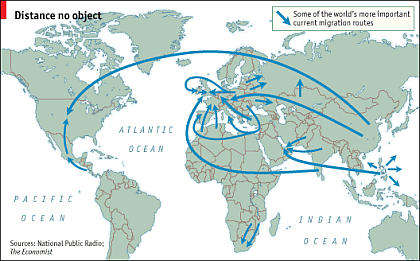 It’s shows place of origin for foreign born immigrants. I think that from a local missions point of view it can be helpful. I remember when 90 Russian and Turkish speaking Turks moved into Abilene, Texas from Krasnodar, Russia nearly 10 years ago. What an opportunity that was for those ready for it. Good thoughts, Mark. The City of Leipzig, like most other metropolitan areas of Germany and Euprope in general, are becoming more and more international. As an example, Leipzig has some of the least restrictive and open laws for foreign peoples looking for work or for a new life. The logistical problems that accompany such an influx are sometimes overwhelming. The fact is, however, Germany is buckling down for continued growth in this area. The future of missionwork in this area not only looks open and promising, but the potential for these influences spreading to all corners of the globe make it even more exciting. Thanks, Mark. I’m so glad you said this. It’s a reality I’m coming to see here too. In the case of the Czech Republic, many of these foreigner groups (including Anglophone expats in Prague) cluster among their own kind and don’t always speak Czech very fluently. For a full-fledged ministry to them, it might have to be in their native languages. I don’t harbor illusions about being able to learn Vietnamese fluently enough to minister to them in the ways they would probably need, but a little language might allow me to test the waters. Czech TV actually did a piece on Vietnamese missionaries coming from Vietnam in order to minister to their expat countrymen here. I’ve also long thought the Czech Republic could be a potentially good field for a Ukrainian missionary to evangelize among his/her own people. If Ukrainians are receptive in their homeland, then could they be at least as receptive in a foreign country, where they are uprooted, dependent on others, and seeking to start new lives? And then if a faith movement takes off among immigrant groups, could it spill over and feed into Czech evangelization as well? Would “post-Christian” Europeans be more likely to open their eyes if the missionaries among them were not just from the American Bible Belt, but from all corners of the globe, expressing Christ’s gospel in all its multicultural richness and unity? The possibilities are as limitless as God’s love for people! So please pray for all Christians (including missionaries) in Europe. Pray for faith. Pray for the immigrants. And pray that we will keep our eyes open to all the possible ways that God can use us to reach the lost. Well noticed Mark, so called “unreachable” people are coming to our doorstep. Surely a great missionfield, it`s just a question who takes the effort and the opportunities. People today don`t have to go to the “bush” if they are ready to meet needs right infront of them. If we don`t do it, the other side will and we will be in for nonpleasant surprises. Tolerance became a big word with continously lesser good meaning and excuse often for not reaching out! Nick Vujicec says: “Put a “G” infront of “disability” and it reads “God is able!” And we are privileged to join into His possibilities! Let`s do it! Well said, Mark, as always. For that matter, but not to detract from your thesis, with which I wholeheartedly agree, the USA is a mission field in exactly the same sense. We just need to mature to the point that we are more interested in the expansion of the kingdom of God than in protecting US culture from the invasion of the non-English speakers. Thank you for adding FriendSpeak to your menu. I can only emphasize how right you are, Mark. I am reading Mark with a man from Iran. We have already read Luke, Acts, and John He is very close to a decision. Two weekends ago I was the lone rep of the free churches for a inter-religious meeting here in our part of the city; half Muslims, half Christians from the state churches, etc. We will be meeting often to discuss our common values. Diversity shows itself even in our fellowship. Thank you for your thoughts!